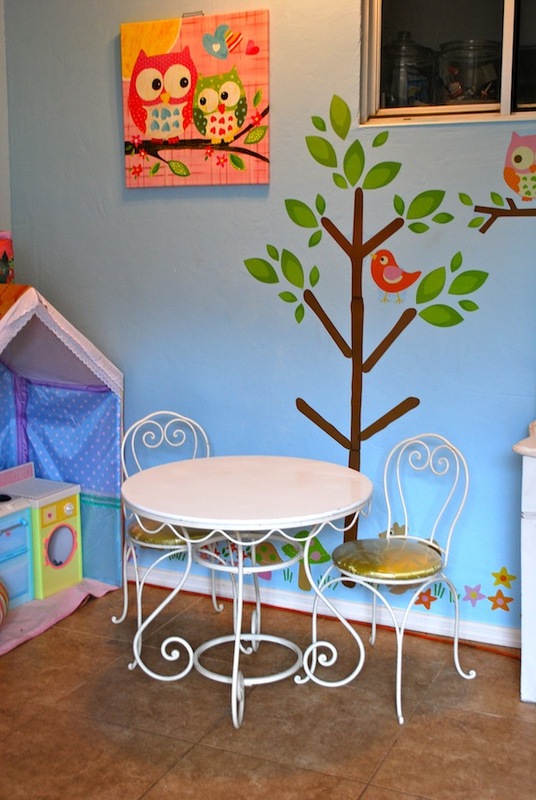 The playroom was once an “Arizona room” but was converted into an actual useable room. 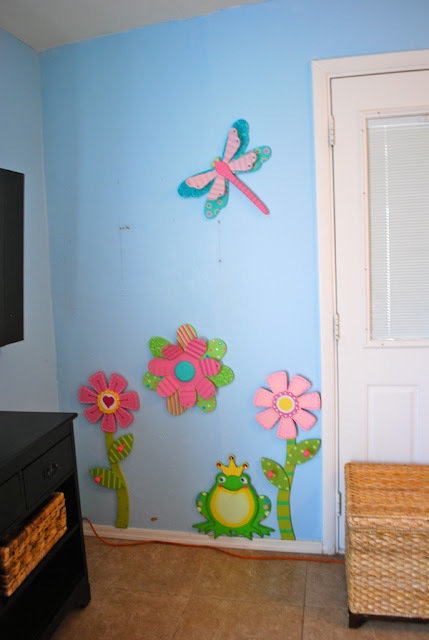 Its the perfect space for my kids to go crazy. It was already painted this blue color when we moved in. I loved the color so we kept it. These wooden cut outs were found at Hobby Lobby and with the 50% off discount they were each about $12. I loved how they add dimension to the wall. This vinyl was the best $12.99 ever spent! I love love love this vinyl I found it at target and you get a ton for only $12.99 and then I got the cute owl picture on canvas to match the set. I love that its cheap and it can totally change a room in the matter of seconds. And when I get sick of it I feel like I am wasting a ton of money to redo the room. How cute are the owls and the little critters! The bottom two branches had leaves on them but my two year old wanted stickers so she peeled them off. Oh well.. it still is super cute. This cute table and chairs were given to me by my mom my little sister had them in her room but now that she is 11years old she no longer needs them so I got them. Dont you just love scallops! This is my old vanity that I no longer needed so this is were my girls can play dress up, I still need a cute chair. 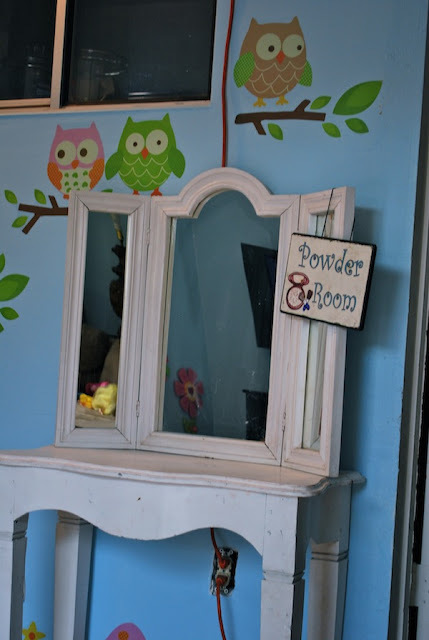 So that is a little peek into our playroom! Love the room! 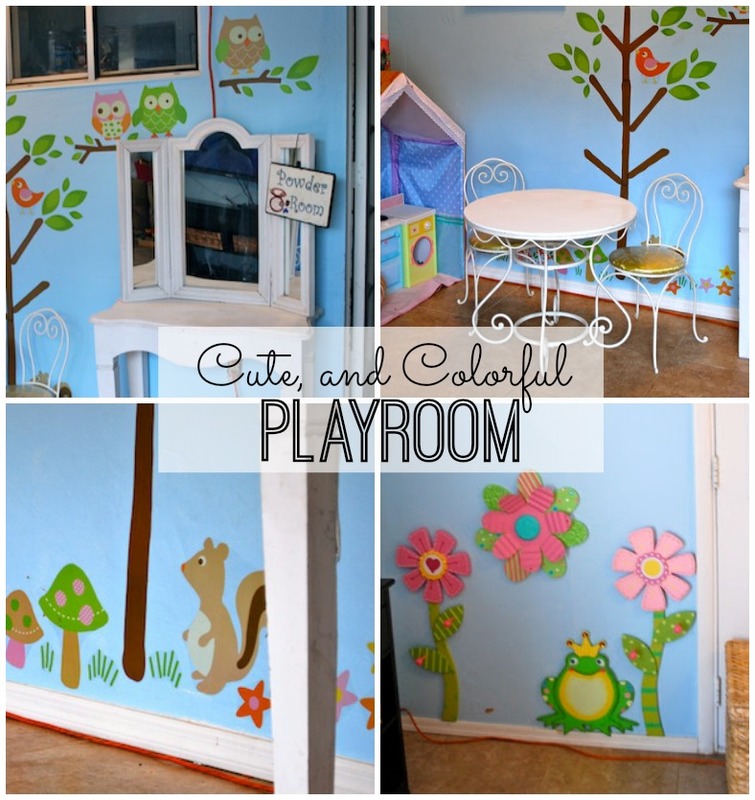 How fun to actually be able to have a play room. I would die for one. How cute! I would love a play room. I bet your girls love it! It’s adorable! I like the three dimensional wood cut outs.